kicked off our pilot PONSHOP Academy Program. We worked with students over the course of six weeks to explore mixed media (collage and painting), ceramics, and sculpture. Students were encouraged to push their boundaries in terms of their creative skills and willingness to work with new materials. Below are some photos from the workshops taught by Gabriel Pons (The Collage Bridge Project), Scarlett Pons (Ceramic Pockets and Masks), and Leslie Brier (Wire and Nylon Sculpture). Good work students! PONSHOP Academy will be initiating again in January of 2015. Click Here for our current class schedule and registration form. 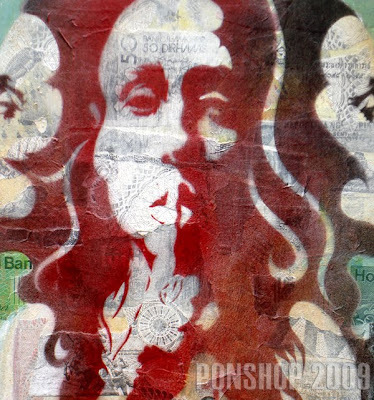 Gabriel Pons will be premiering his latest work in March at PONSHOP Studio and Gallery. Titled Facades, this mixed media series on custom-shaped wood panels are evocative of architectural forms that have been pervasive in his work throughout the years. Incorporating paper collage, acrylic paint and spray paint, Pons reflects upon his experiences living in New York City as well as traveling throughout Europe. His work combines the formal sensibility of architectural structures with spontaneous and gestural painterly actions emulative of what he has observed in city streets, layering found imagery, text, and handwritten prose. “The city has a way of looking back at you sometimes and speaking to you – that’s the inspiration for this current series”, Pons remarked. Join us March 7 from 6-10pm for the opening reception of Facades to view Pons’ latest mixed media pieces. In addition, visit PONSHOP to see new ceramic work from Scarlett Suhy-Pons, jewelry from Elaine B., Elisa Shere and many others as well as fine art from contributing regional artists. There is a misconception that if you cannot draw well, then you are not artistic. In three 1.5 hour classes, adult students of all skill levels sharpened their skills in collage, stenciling, acrylic painting, and more. Instructor Gabriel Pons lead students from developing beginning ideas to executing mixed media artwork. 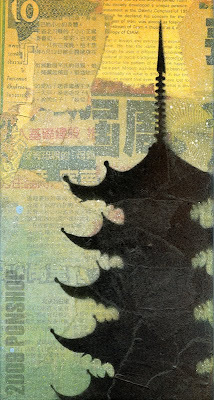 Pulling imagery from magazines and cutting stencils are few of the techniques used in this class to create with. Students leave this class with a finished piece on canvas. 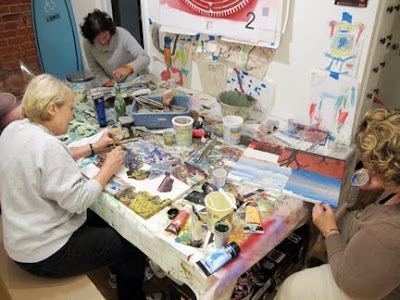 Want to expand upon your art-making skills or simply have fun creating something new? Click Here to view our current class schedule. For further questions, contact PONSHOP. Gabriel Pons will be the guest instructor for a mask-making workshop called, "Mask and Mirror" at the Fredericksburg Area Museum and Cultural Center in November. Online Registration is now open! The "Mask and Mirror" workshop explores the theme of adornment and how different cultures modify the surface of the body for decorative, aesthetic, and cultural purposes. This fascination with marking and altering our appearance is evident in contemporary culture exemplified in the cosmetic industry and the mainstream proliferation of the tattoo industry. 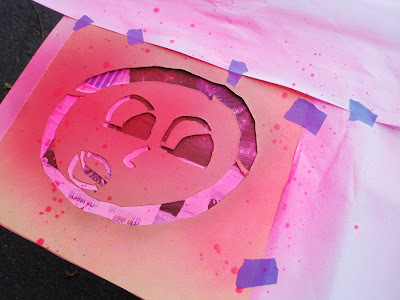 Students will create their own mask using a prefabricated blank form and customize it using paper collage techniques, acrylic paint, and colored pencils. The effort of the exercise will be to encourage students to "look within" themselves and project their passions, interests, and voice on a three dimensional canvas. Whereas a conventional mask is meant to conceal one's identity, the intent of these masks is to reveal the student's personality and hopefully discover something new along the way. When: Saturday, November 23, 2013 10am-noon. Gabriel Pons of PONSHOP partnered with the Fredericksburg Area Museum and Cultural Center for a three-day summer art camp from July 15-17, 2013. The theme of the camp was "Art Outside the Box". Students were instructed to draw upon the city's rich history and built environment to create a collaborative mixed media mural to be installed on the William Street facade of the museum. Throughout the three days, Pons gave the students a background of the history of graffiti and street art and coupled their activities to "interrogate" the cityscape of Fredericksburg. What is the message of the signage that we view in the streets day to day? 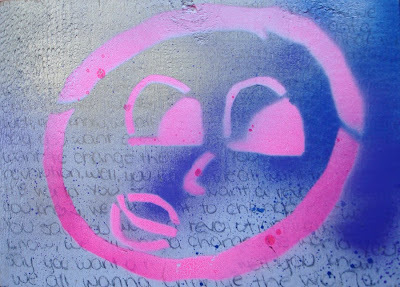 How can students express themselves using only text or only imagery? How can we reinterpret historic themes in a new way? Below is a chronology of the workshop sessions. Students used wheat paste to collage imagery and maps relating to the city of Fredericksburg on six wooden panels. They were encouraged to explore writing their names using different styles and methods. Pons gave students a tutorial on how to design, cut, and spray various stencils and students then collectively painted the six panels using spray paint, acrylic paint and stencils. The completed panels were installed in the existing window wells of the museum. Thanks to Janelle Kennedy, interns Caroline Fogg and Dani Payne, and the staff of the Fredericksburg Area Museum for contributing to the success of this workshop. Special shout outs to our campers for the week. They're excitement and genuine enthusiasm made the project worth while. Good Job Students! 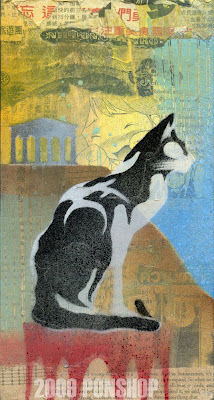 July's Adult Stencil and Mixed Media workshop boasted three motivated students. In the three 1.5-hour sessions, students worked with collage, acrylic painting and stencil/spray painting. Below are pics from the sessions including the final pieces. For a current PONSHOP Class Schedule, Click Here. 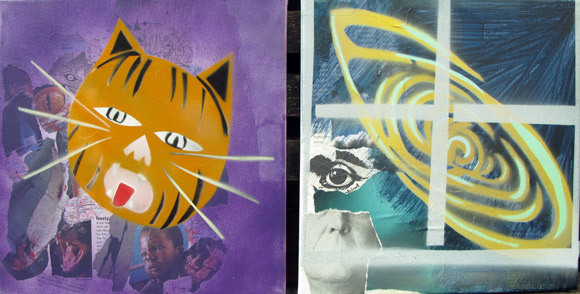 Our students from June's Adult Stencil & Mixed Media have completed their masterpieces. 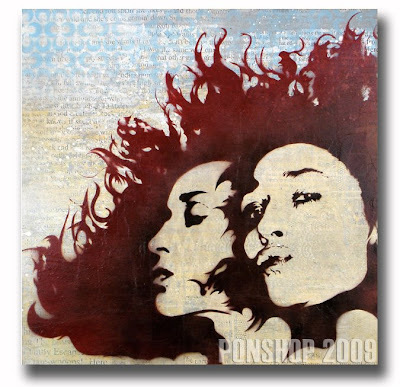 Check out what can be done by creatively combining original stencils, spray paint and the art of collage. Feeling inspired? View our class schedule to find out more. 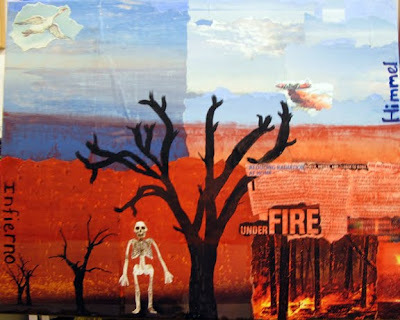 PONSHOP's October Adult Mixed Media Class hosted four enthusiastic students willing to get their hands dirty using mixed media (paper collage and acrylic paint). Below are some photographs of their work at the end of their last session. Good Job! 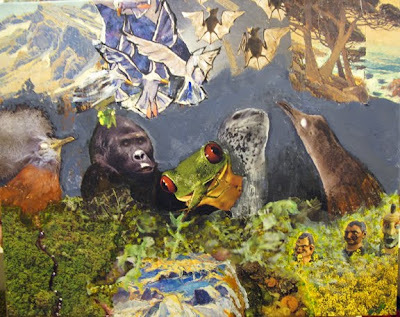 Theresa's composition incorporated intricately cut collage pieces as well as hand painted text and form. Patricia's piece was as fluid as her personality - vibrant colors and gestural paint strokes complemented her collage assembly. 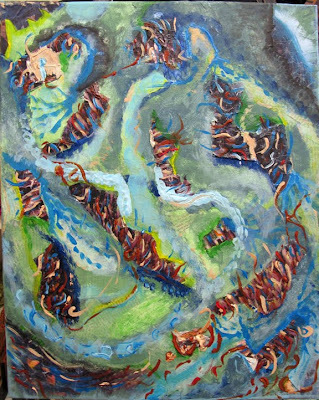 Kathleen's experience in mixed media and painting is evident in her composition. 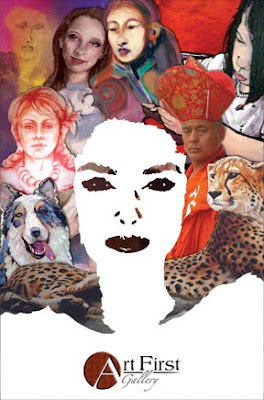 She skillfully merged found image with acrylic paint. 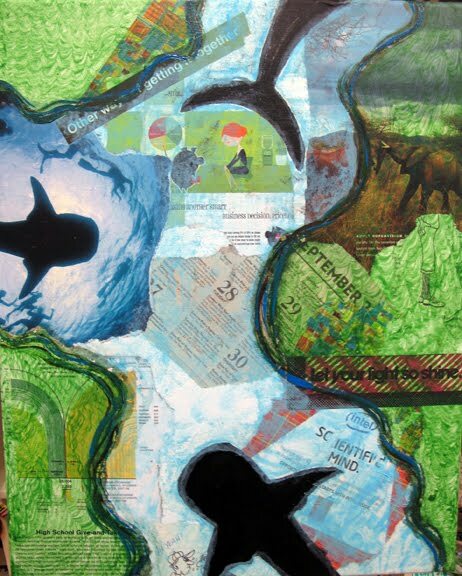 Kassandra's piece explored the transparency of acrylic paint with the patterning of mixed media collage. 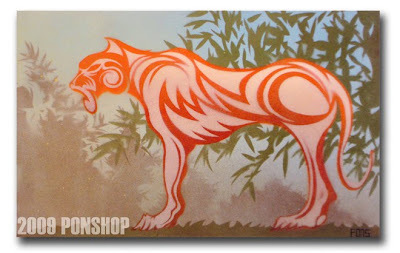 PONSHOP offers class in Ceramics, Mixed Media, Street Art, Architecture, and Skateboard Design for children and adults. Our classes run throughout the winter. For a current class schedule, Click Here. After covering her board with collage materials found in comic books and magazines, Savant drew and cut a 4-foot long pattern to be used for the first layer of spray paint. 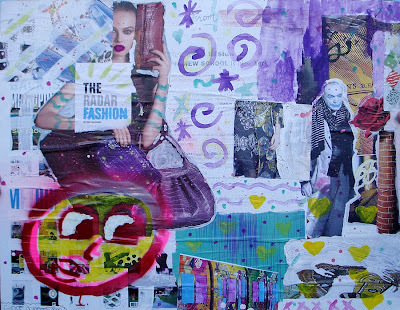 Once she sprayed her background and "Sam" Stencil, she returned to the painting with a thick marker to highlight elements in the collage. Her stencil "signature" turned out quite well considering we had to spray it in 35 degree weather...Good Job! Gabriel Pons holds art workshops for children and adults monthly. 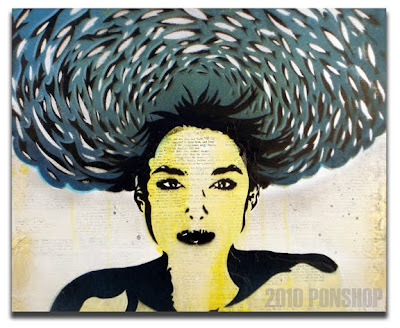 For a current listing of PONSHOP classes, Click Here. "I Believe in Mr. Grieves"
February, 2010. Scarlett heard this report that our music tastes are most acute and malleable up until we're 20 years old. If that's the case, then I'll be listening to the Pixies when I'm eighty years old. Th above painting was inspired by a Pixies song - the lyrics go: "...what's that floating in the water oh neptune's only daughter i believe in mr. grieves"
"Neptune's Daughter" is on exhibit this month at Art First Gallery (824 Caroline Street, Fredericksburg, VA) as part of the themed "Portraits" show. Check out this all member exhibit. Opening Reception is Friday, February 5, from 6-9pm. I'm pleased to share the latest small works paintings. They are on display in galleries around Fredericksburg, Virginia and our studio for the month of December. Enjoy! 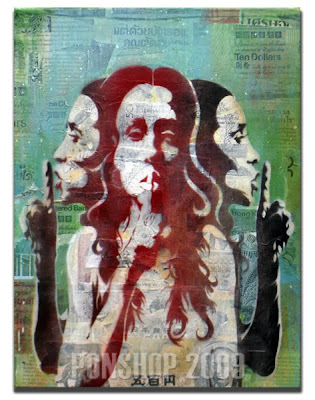 "Hush", Collage, Acrylic, Spray Paint on Wood, 18"x24" $475. "Masked Villain", Collage, Acrylic, Spray Paint on Wood, 24"x24" $375. September 2009: This is the latest piece up at Spaghetti Project (1025 Caroline Street, Fredericksburg,VA). For those that are fans of the Metal Face Doom - enjoy and "remember ALL CAPS when you spell my man's name..."
August 21, 2009: Agio Clothing and Spaghetti Project hosted an "Open Paint" event at the University Cafe a couple weeks ago. Three artists from the region (including myself) got their paint on for three hours while the crowd moved to the DJ sounds from Turnstyle (Richmond, VA). There was even a communal canvas going on which got visitors up on stage too. I apologize for the lack of pics - but hey I was busy working... To view more, click this link to FredPicture, a photo blog of the Fred-burg or hit up Agio's Blog. 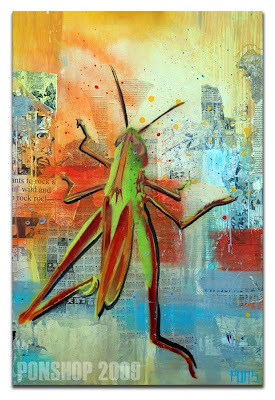 "Grasshopper #1", Mixed Media on Canvas, 24"x36" $275. 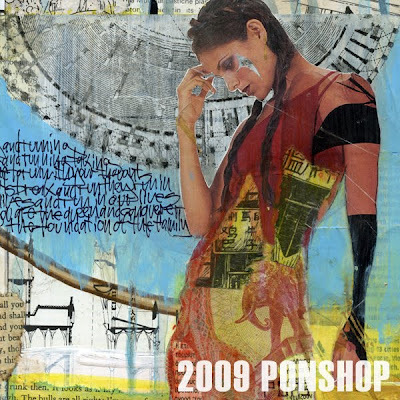 July 13-17, 2009: The PONSHOP Student Mural Workshop was a great success. For one week, students had a chance to conceive and execute their ideas on a 12-foot by 8-foot canvas. Below is the (2 part) video chronicle of that week as well as some photos. Congratulations to all the students ( Ben, David, Finn, Johnny, and Jeff) as well as our photographer/videographers Allison and Zeph. From the PONSHOP class listing: "The mural is an effective way of bringing people together to create artwork that is intended for the public realm. This workshop will encourage students to work as a team to conceive and execute a large-scale mural. Imagination, self-expression, and cooperation are the keys to achieving this goal. Students will have access to explore a variety of media (acrylic paint, spray paint, stencils and collage) to adorn their collective wall." July's "Intro to Street Art" workshop boasted some of the hardest working students to date. Not only did they bring fresh new ideas to the table, they also worked overtime on their pieces to take them to the next level. Nice work students! 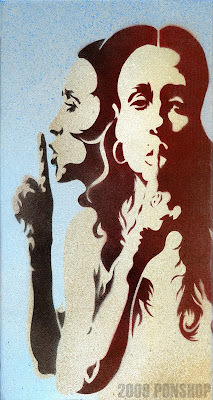 Trey did a contemporary take on the traditional silhouette figures using collage and stencils. Josh came to the first class full of ideas, enthusiasm, and a whole kit of tools at the ready. His piece (above) was executed with wheat paste collage, acrylic, and spray paint with stencils. 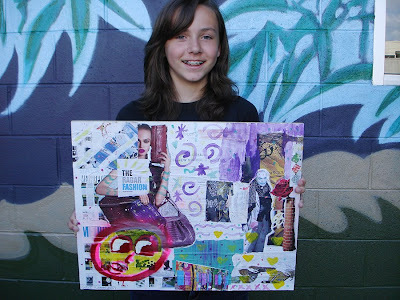 Grace used magazine clippings, acrylic paint, and stencils to construct her piece. 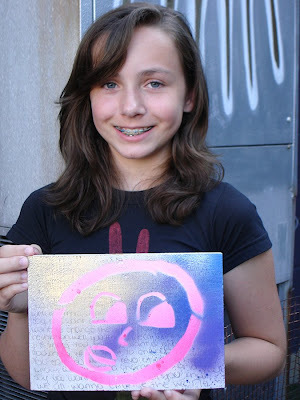 She also did a stencil piece on wood with her favorite song lyrics written in the background. Her Stencil was derived from a series of drawing exercises we did during the first class. Click Here for a complete PONSHOP class schedule. Students are provided a 48"x24" masonite board that they then prime and begin painting. David used a variety of spray paints to give his background more depth and interest. He used an enlarged copy of his robot sketch for the foreground figure. For a Current Schedule of all PONSHOP classes, Click Here. Latest Painting: "My Baby Wants to Rock and Roll #3"
Below is the most recent painting completed: "My Baby Wants to Rock and Roll #3." 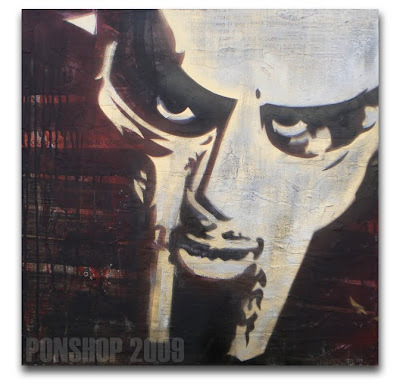 Many have seen and/or worn this graphic over the years, and I've always wanted to keep pushing it and explore some new aspects. I did this by building a wood panel and using collage (made from newspaper and magazine scraps as well as printed song lyrics). 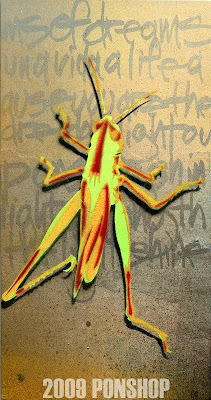 This led to some interesting conditions between the pattern and text in the background and the stenciled figure on top.